^ Thai name: กรุงเทพมหานคร Krung Thep Maha Nakhon or Krung Thep. The full name is กรุงเทพมหานคร อมรรัตนโกสินทร์ มหินทรายุทธยา มหาดิลกภพ นพรัตนราชธานีบุรีรมย์ อุดมราชนิเวศน์มหาสถาน อมรพิมานอวตารสถิต สักกะทัตติยะวิษณุกรรมประสิทธิ์ Krung Thep Mahanakhon Amon Rattanakosin Mahinthara Yuthaya Mahadilok Phop Noppharat Ratchathani Burirom Udomratchaniwet Mahasathan Amon Phiman Awatan Sathit Sakkathattiya Witsanukam Prasit. Thailand (/ˈtaɪlænd/ TY-land or /ˈtaɪlənd/ TY-lənd; Thai: ประเทศไทย, RTGS: Prathet Thai), officially the Kingdom of Thailand (Thai: ราชอาณาจักรไทย, RTGS: Ratcha Anachak Thai; IPA: [râːt.tɕʰā ʔāːnāːtɕàk tʰāj] ( listen)), is a country in Southeast Asia. Its neighbours are Laos, Cambodia, Malaysia, and Myanmar. The country's name was Siam until June 24 1939. It was again called Siam between 1945 and May 11 1949, when it changed back to Thailand. The word Thai (ไทย) comes from the ethnic group in the center of Thailand. The capital city is Bangkok. 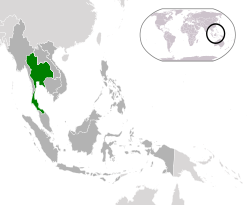 Thailand is the only country in Southeast Asia that was not ruled by Western countries as it served as a buffer zone between English and French colonies. Thailand is a constitutional monarchy. It has a King as a head of state. The current monarch is Vajiralongkorn. Many people believe that the first Thai state was the Buddhist kingdom named Sukhothai founded in 1238. Sukhothai achieved independence from the kingdom of Cambodia. A century later, a bigger Thai kingdom named Ayuthaya appeared in the South of Sukhothai. Later Sukhothai became a part of Ayuthaya. Ayuthaya existed for more than 400 years before its fall by the attack of a Burmese kingdom. A Thai soldier of Chinese origin then founded a new capital city at Thonburi, and became King Tāksin. Thonburi was the capital for a short period. The current era, Rattanakosin, started on the foundation of Bangkok as the capital city by King Rama I of Chakri Dynasty. Before 1932, Thailand was an absolute monarchy, meaning the King had total power in the country. On June 24, 1932, a group of people staged a coup and changed Thailand to a constitutional monarchy. It was not until 1973 that Thai people voted for a Prime Minister in an election. There were coups both before and after this year. In 1951, there was a failed coup - the Manhattan Rebellion. On September 19, 2006, the army staged a coup d'état and took control from Thaksin Shinawatra's government. In May 2014, a new military coup d'état removed another government. In October 2016, Rama X become the new king. Between 1932 and 2014, Thailand had 12 coup d'état. NOTE: In italics , that province represents the Greater Bangkok sub-region; in italics , that province represents the West sub-region. ↑ 1.0 1.1 Thailand, CIA World Factbook. ↑ "Wayback Machine" (PDF). web.archive.org. 16 July 2011. ↑ 5.0 5.1 5.2 5.3 "Report for Thailand". World Economic Outlook Database. International Monetary Fund. Retrieved 25 July 2011. ↑ "Merriam-Webster Online". Merriam-webster.com. 25 April 2007. Retrieved 25 April 2010. ↑ Thailand (Siam) History, CSMngt-Thai. This page was last changed on 12 February 2019, at 18:04.